Given what locomotive engineers had to contend with on the east end of the Carrizozo Sub, by 1984 it was a wonder that trains moved at all. Beyond the broken-down track, the construction and the heavy traffic, locomotive engineers had to contend with hill-and-dale country most of the way. On some of the hills, such as the westbound 1% pulls through Arabella and south of Leoncito, trains also had to snake through heavy curvature. Near Corona trains crested at 6724', only about 200' lower than Donner Summit. The high altitude, coupled with abundant sand and dust, conspired to starve locomotives of oxygen. The 7700-7800's GE's were particularly sensitive to clogged filters and routinely shot fuel-rich flames three feet above their stacks. Filters that loaded-up northbound stayed that way if the units turned at Kansas City, because SP had no open locomotive facilities at the ex-RI Armourdale Yard. Tucumcari had a roundhouse foreman, whose roundhouse was his pickup truck. 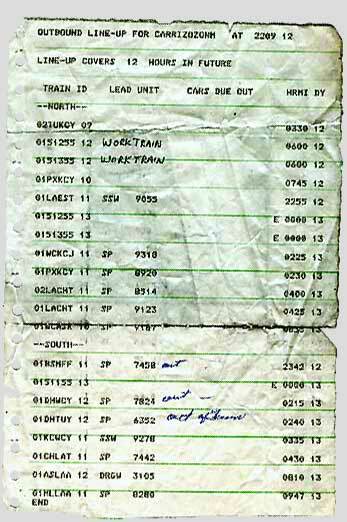 Outbound line-up of trains for Carrizozo for half a day sometime in mid-1984: 20 trains! Since many of the trains had dead, non-loading, or partially-loading power in their consists, head brakemen became firemen and mechanics in sometimes vain attempts to keep their trains from falling down (stalling) on the hills. This was a violation of labor agreements, but this was preferable to dying on the law (running out of Hours Of Service time) and having your kids grow up and get married while you were rotting away on some remote siding. 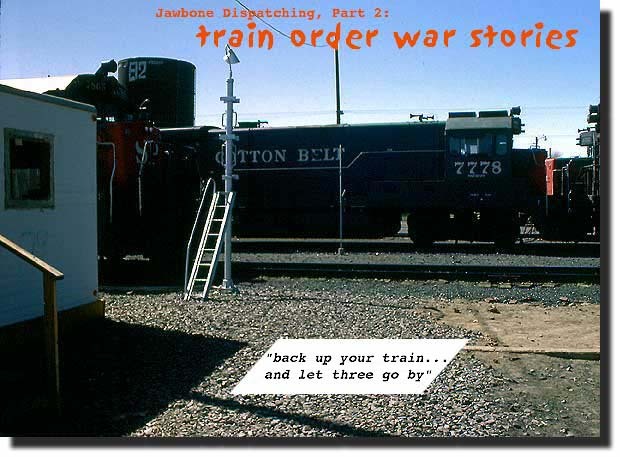 On one particular day early in '84, as the head brakeman of a five unit westbound grinding up the grade at Arabella, I dashed back and forth several times along the walkways between three recalcitrant units in a semi-vain attempt to keep them going (curse those two GE's! ), only to realize that I could make better time between them by running ON THE GROUND - we were making three m.p.h. at best. We didn't stall on the hill, but at the expense of the 7630. I had fusees wedged between the unit's hood doors and the crankcase pressure and hot water reset buttons to keep the buttons from popping out and killing the engine. The engine finally gave up with a horrible, internal metal-on-metal shriek. I think she ran out of lube oil. A related aside: An engineer could tell that he was taking charge of a bad EMD if opening the hood doors caused a couple of fusees to drop into an engine sump already littered with same. A wise engineer removed his wedged fusees at the end of his run, because at the very least, if the wrong person discovered the infraction, the engineer stood for some unpaid leave. Worst case, that fusee jammed against the crankcase overpressure button could precipitate a crankcase explosion in some unsuspecting person's face somewhere down the line. Like her sister GE's, system unique #7771, rebuilt as a B-unit after a wreck, had a low tolerance for desert sand (shown here near Tucson, 9-83). One hot summer day in 1984, the 7771 was in the consist of my eastbound train, and at some point in route, the engineer noticed somebody opening the unit's door from the inside and called ahead to Tucumcari for La Migra. After we arrived, Immigration Police coaxed out five illegal refugees from the civil war in El Salvador. 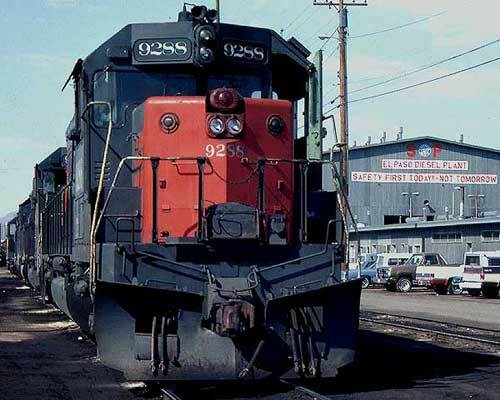 A bad arrangement: the closest locomotive facility to Tucumcari was El Paso (photo, left), 330 miles away. A patently dumb arrangement: if a unit on a Kansas City - bound train gave out at El Paso's north city limits, it was dead weight all the way to K.C. and back - about 1900 miles. SSW's ex-RI Armourdale yard repair facilities were not open in 1984. Luckily, few of these behemoths were still around in 1984 - the event was so unusual for Carrizozo at the time that I dug out the camera to snap this photo. Although they were crap as locomotives, their crappers were quite civilized: a stand-up headroom compartment in the hood, accessed through the rear cab wall. This surely beats the hunch-over configuration in most other low-nose units. Pure digression: a Wx4 Travesty in Design Award goes to MPI for the toilet locations in their MP36PH-3C's. Of course, SP had power problems everywhere at the time. 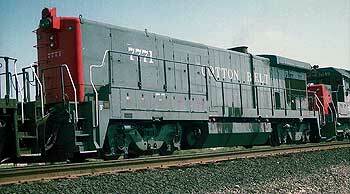 As a disgusted GM rep in Carrizozo told me one day, "They [SP] buy locomotives with every conceivable bell and whistle...and in six months they're junk ." But the thing was, on the Golden State Route things were worse than the SP norm, because running repairs and servicing were limited to what could be done with proverbial spit and Scotch tape. If a train's power conked out, the engineer only held three reasonable options: rob another train of some power; head into a siding and wait to be rescued; or double the hill. The latter course of action has always been that of last resort, not only because your typical crew would rather twist naked in the wind than double a hill, but also simply because the process could tie up the railroad big time. 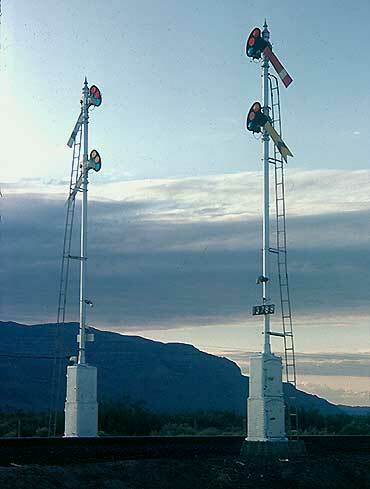 Here, the fundamental problem often was arranging the movements, not making them, since the Carrizozo sub was still a train order dispatched, semaphore protected, wooden axle railroad. Our story continues on the next page, but at this point you might want to take a quick look at Wx4's exclusive A Train Order Primer to get some idea of the complex, encumbering nature of moving trains under that system. I say BRIEF, because you could become mired for hours, otherwise. 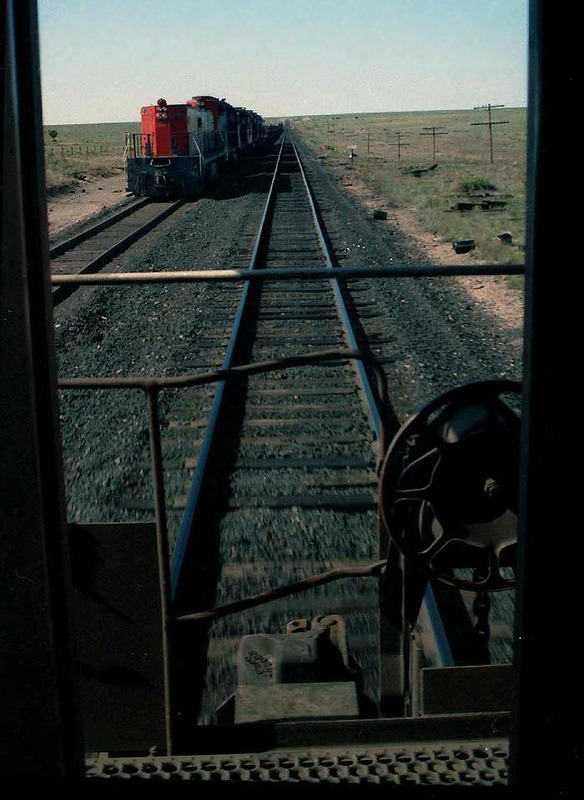 Passing a work train tied-down at Leoncito, mid-1984: Previously, another train must have robbed the end unit from this amply-powered consist, putting the (TEBU) slug unit in the lead. The work train crew probably had few kind words about the situation when they showed up, since they would have had to make a 'turn' on the power to cut the slug into the consist. (left) Three trains sit at Santa Rosa, New Mexico's train order office, waiting for the dispatcher to sort out The Big Jackpot (story below).